No matter how many times some may call them “pristine,” or “untouched,” the lands and waters in the United States that we recreate in and upon were not “virgin” before 1492. In making national parks and other landscapes part of the national, natural heritage, the federal government and the dominant white culture erased the significance of these places to those who came before us and are still with us. Today, the National Park Service is only beginning to stop the exclusion of Native Americans from these landscapes; it is only beginning to acknowledge the harms caused and the damage done. While the attention of much of the outdoor community is currently focused on one of our newest national monuments, Bears Ears, conversations and debates are rekindling about our very first: Bear Lodge, otherwise known as Devils Tower. 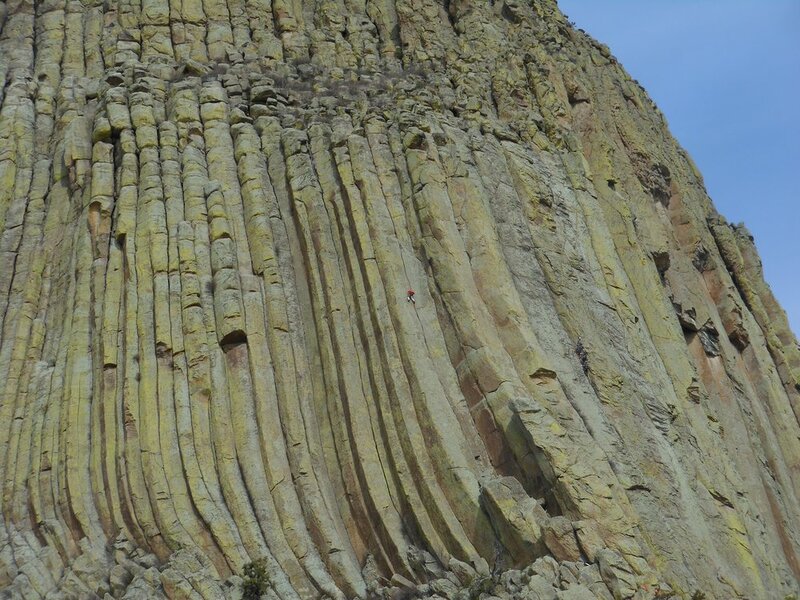 In 1995, the National Park Service implemented a voluntary rock climbing closure every June to respect the wishes and beliefs of the Northern Plains tribes for whom Bear Lodge holds tremendous spiritual, cultural, traditional, and historical significance. The implementation was tremendously controversial, leading to litigation in some of the highest courts, but over the course of time this imperfect compromise settled down. Having spent the bulk of 2015 researching for and writing my undergraduate thesis on the history of the controversy over climbing at Bear Lodge, I feel compelled to respond to the conversations underway this summer, and in particular to the writings of Abegg and Reed. Despite the title of Abegg’s piece - “Why I Can’t Write About the Voluntary Closure,” Abegg did write about the closure. And, despite her plea for folks to withhold opinions and visit Bear Lodge with an open mind - a poorly veiled urging to maintain the status quo of white settler dominance over this landscape - she did give us her opinion on it, writing, “I’m in Devils Tower in June, and I’m guiding, and I’m climbing.” Regardless of how many times Abegg insists the issue is so complicated and that we should all simply listen to each other, by climbing (and guiding), in June, she has already made her position on the closure clear. She does not respect it. Nor does Reed, nor the other climbers and guides who ascend the Bear Lodge in June. While those climbers who choose to violate the closure are in the minority, it is critical that we understand and historicize the arguments climbers are making against the closure (or for climbing regardless of the closure). Their individual and personal reasons may vary, but the arguments put forth echo those expressed in the negotiations and legal disputes over the development and implementation of the closure in the mid-1990s. Ranging from statements that climbing is a spiritual pursuit – effectively appropriating tribal understandings of and relations to the Bear Lodge – to arguments that the tribes have more important things to worry about than climbing on some rock, such efforts to legitimize climbing at the Bear Lodge are propped up by white privilege and a history of violence and oppression of Native Americans. During the negotiations and legal wranglings surrounding the climbing management plan in the 1990s, climbers sought to appropriate language used by Northern Plains tribes in order to position rock climbing at Bear Lodge as equally spiritual, religious, traditional, and/or historical. In his piece, Reed in particular draws upon the “climbing is a spiritual experience” argument, going as far as to state that “if there is one group of people who can even come close to capturing the real spirituality that the American Indians have for a place like this, I hope it’s climbers.” Anthropologist David Kozak, writing about rock climbing and Traditional Cultural Properties, asked, “Are climbers consciously or unconsciously adopting a spiritual discourse as a strategy and as a way to legitimize their activities?” Yet it does not matter whether or not climbers invoking this argument are intentionally appropriating the language of spirituality: the result is to position themselves and their desire to climb Bear Lodge over the experiences and beliefs of the Northern Plains tribes, continuing a history of violence and erasure. The ostensible concern Abegg and Reed state for the extensive problems of the Northern Plains tribes ties deeply into their efforts to portray their pieces as nuanced think pieces. Abegg’s post in particular could be summed up as “it’s complicated,” and Reed’s as “can’t we all just get along?” But “it’s complicated” is a Facebook relationship status and an intellectually lazy statement. It is not a way to conclude thoughts on a challenging topic. Both notions leave the status quo in place – a status quo that leaves privileged climbers happily going about their adventures without much thought as to consequences of their actions. Abegg states that she’s stood for Standing Rock and other buzzword liberal causes, yet when her own privilege – the Park Service-sanctioned ability to climb (and profit from guiding) at the Bear Lodge – is threatened, she embodies a classic “ally” position. Somehow Abegg, Reed, and others think they know better, that the tribes should worry about other things, and anyhow it’s all too complicated and nuanced and can’t we all just get along? For a just and equitable society, those with privilege and power will have to give up that privilege and power. It should not be too much to ask of climbers to avoid climbing at Bear Lodge or sacred sites on public, tribal, and private land across the nation and the world. It would be a small step towards recognizing and reconciling the part climbers have played in a history and a present of violence. The debate over the name of Bear Lodge has been ongoing for decades. At present, a number of members of the Northern Plains tribes are pushing for the national monument’s name to be changed from “Devils Tower” to “Bear Lodge.” Recognizing the extensive history of white settlers renaming indigenous places, at times with particularly negative appellations like “Devils Tower,” I refer here to the monument as Bear Lodge. Bob Moen, “Debate simmers over name of Devils Tower monument in Wyoming,” Casper Star Tribune, published October 7, 2016, http://trib.com/news/state-and-regional/debate-simmers-over-name-of-devils-tower-monument-in-wyoming/article_a7864143-ea97-5560-a94c-addd66e4c533.html. See also Anna Marie Kramer, "The Power of the Tower: Contesting History at Bear Lodge/Devils Tower National Monument" (2016), Pomona Senior Theses, 151, http://scholarship.claremont.edu/pomona_theses/151, 6. The National Park Service states that the following twenty tribes have potential cultural affiliation with the Bear Lodge: Assiniboine & Sioux Tribes of the Fort Peck Indian Reservation, Montana; Blackfeet; Blood (Canada); Confederated Kootenai & Salish Tribes of the Flathead Reservation, Montana; Cheyenne River Lakota; Crow; Crow Creek Lakota; Eastern Shoshone; Flandreau Santee Dakota; Lower Brule Lakota; Northern Arapaho; Northern Cheyenne; Oglala Lakota; Piikani (Canada); Rosebud Lakota; Sissteon-Wahpeton Dakota; Southern Arapaho; Southern Cheyenne; Spirit Lake Lakota; Standing Rock Lakota; The Three Affiliated Tribes (Mandan, Hidatsa, and Arikara); Turtle Mountain Chippewa; and the Yankton Dakota. For the purposes of brevity, I use the regional designation - the Northern Plains tribes - when referring to this group. George L. San Miguel, “How Is Devils Tower a Sacred Site to American Indians,” National Park Service: Devils Tower National Monument, last updated September 29, 2015, http://www.nps.gov/deto/learn/historyculture/sacredsite.htm. David Robbins, “Sport, Hegemony and the Middle Class: The Victorian Mountaineers,” Theory, Culture & Society 4 (1987): 581, 587; Bruce Erickson, “Style Matters: Explorations of Bodies, Whiteness, and Identity in Rock Climbing,” Sociology of Sport Journal 22 (2005): 373–96; Reuben Ellis, Vertical Margins: Mountaineering and the Landscapes of Neoimperialism (Madison: University of Wisconsin Press, 2001). Mark David Spence, Dispossessing the Wilderness: Indian Removal and the Making of the National Parks (New York: Oxford University Press, 1999), 8, 29. William Cronon, “The Trouble with Wilderness: or, Getting Back to the Wrong Nature,” Environmental History 1 (1996): 13. Kramer, “The Power of the Tower,” 78-95. David L. Kozak, “‘Between a Rock and a Hard Place’: Rock Climbing and Traditional Cultural Properties,” The Applied Anthropologist 26 (2006): 170-1, 178. Maribeth Gustafson, “Record of Decision,” quoted in Matthew S. Makley and Michael J. Makley, Cave Rock: Climbers, Courts, and a Washoe Indian Sacred Place (Reno: University of Nevada Press, 2010), 84. Bear Lodge Multiple Use Association v. Babbitt, 2 F. Supp. 2d 1448 (D. Wyo. 1998), quoted in Erik B. Bluemel, “Prioritizing Multiple Uses on Public Lands After Bear Lodge,” Boston College Environmental Affairs Law Review 32 (2005): 388; and Lloyd Burton and Dave Ruppert, “Bear’s Lodge or Devils Tower: Inter-Cultural Relations, Legal Pluralism, and the Management of Sacred Sites on Public Lands,” Cornell Journal of Law & Public Policy 8 (1999): 229. Kramer, “The Power of the Tower,” 75. Anna Kramer is an upstate New Yorker who has done her best since age eighteen to make herself as homesick as possible. A writer and a student of history, she is figuring out how to balance her work in outdoor education with pursuing higher studies in environmental history, all while loving her family, raising a puppy, climbing cracks and in the alpine, and riding her bike as much as possible. She currently divides her time between Leadville and Boulder, Colorado, though if she had her druthers she would live in Indian Creek full time. Follow her @annamarie_kramer.